Hear from our Team! 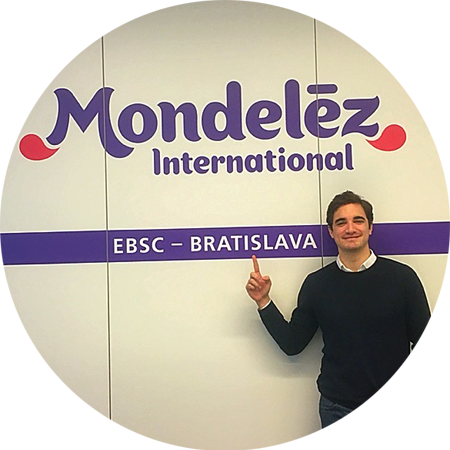 Finance at EBSC, Bratislava | Careers | Mondelēz International, Inc.
EBSC stands for European Business Service Centre. But it’s so much more than that. EBSC is home to a very talented group of technical experts from Finance, Information Technology Solutions, and Procurement who support our global business. EBSC has evolved to become a true centre of excellence, where great minds work together to partner with the business and provide strategic leadership. Here we hear from some of the Finance team about their experiences while working at EBSC. Within my role at EBSC, I support the Global RDQI leadership team, and the sub-functions they manage, with all aspects of overhead and capital investments. Sometimes it is strategic project reviews, other times it is actual vs budget reviews and assessing what the year-to-go risk profile looks like, or it could be something related to people development, as part of the local Finance Leadership role I also perform. The main area I currently specialise in is the strategic partnering with the RDQI function, but looking at my career path then I’d say it’s a broad specialisation, spanning Integrated Supply Chain and Overheads Controlling together. I am actively involved in the strategic capital investments that we are making across RDQI, working as part of a steering committee with other strategic stakeholders, including HR, Tax, Legal, Real Estate, Procurement, Engineering & RDQI. We all need to work together to ensure that all our functional requirements are going to be met, as well as those of the total business. In my 16 years at MDLZ, I’ve grown a lot and I am proud of where I’m currently at. I started out as a graduate trainee fresh from university, and was lucky enough to be put on a rotational program working in various financial analyst roles as part of plant controlling and business development in the UK. I was selected for an 18 month management program that required me to work in Production Logistics in Slovakia and that’s how I ended up here 12.5 years ago – I’d say this opportunity probably had the biggest impact on my career and really broadened my horizons. After falling in love with Slovakia, I was lucky to find out that EBSC was just being created, and so I got myself included in the project team to kick off the initial creation of the original centre. After a few different roles in Bratislava & Vienna, I returned back to the Bratislava office in 2012 to set up and lead a new centralised EU RDQI Finance team as part of the remote EU headquarter group, before stepping up in 2016 to take on the challenge of a new Global RDQI Finance team. Aside from the range of different challenging roles I have undertaken, I have also been involved in a range of different development programmes with Mondelez International, including spending a full day at a military training camp, being push to my physical limits and learning the value of working as a team, as well as more recently attending a Campus event, where people from across the world gather to learn from each other and from our leaders. One of the most exciting and rewarding things about my role is being able to help make some incredible investments and having real positive impacts on our people. Getting approval from our CEO for a $15 Million investment in a new state-of –the-art research and development centre in Poland that will give so much opportunity to RDQI employees was really exciting. 1. Take the time to really understand what it is that you’re doing. Don’t rush through the learning experience, take 18 months to learn, grow, and improve within a specific role. Take your time in the earlier years to build your foundation, as this will help you to become a much more rounded Finance professional in the long term, and will build your credibility. 2. Don’t be afraid to try cross-functional roles. One of the biggest learnings for me personally was getting a chance early in my career to try a couple of cross-functional roles. These helped me to develop a very different perspective of how people see the business, as well as being able to share with the other function how their work is impacting the Finance function. EBSC has a really diverse culture, and over the past 10 years I have seen the team become increasing international. I’d say we have a fast learning and fast adapting culture; I love working in the EBSC office because of the energy that it gives off. It’s a modern office, with cutting edge design, and it always puts a smile on my face each morning when I think back to some of the other offices I’ve worked in! 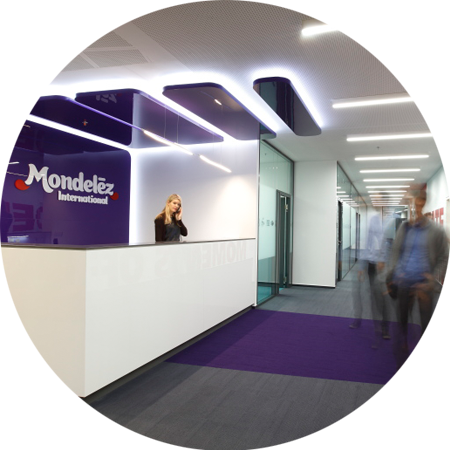 Another great thing about working in EBSC is that we’re a collection of multiple supporting functions for MDLZ, so there are plenty of opportunities for people who want cross-functional experiences, without the trouble of having to relocate. Likewise, I love that there are so many different sub-function finance teams… This allows our people to develop as more broad finance professionals, rather than just working up the ladder in one element of the Finance function. Bratislava is an absolutely ideal place to live. I’m originally from a small village in UK, and appreciate a quiet life where everyone knows everyone. With a population of only half a million people, Bratislava comes across as a relatively small and relaxed place, and yet it is a capital city, with lots of hidden gems, and all the amenities you ever need. I’ve got to say Oreo – my kids love them, too! I joined EBSC two months ago. Before coming here, I worked for MDLZ in Venezuela for three years, specialising in internal controls. I then left to study my Masters in Boston, US, and after qualifying I moved to work in Europe. 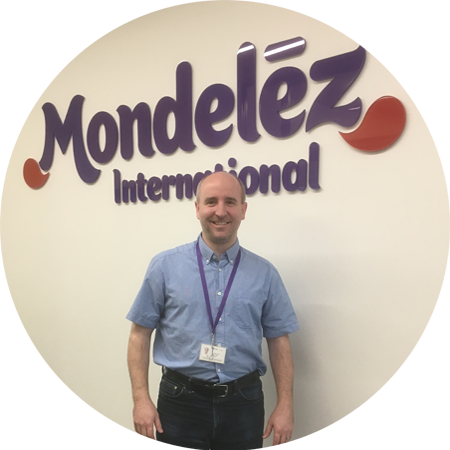 As soon as I moved here, I saw the Mondelez International logo on the side of a building, and started doing some research, as I had always wanted to come back to MDLZ if I could. I now work in Financial Planning and Analysis (FP&A), and partner the Integrated Supply Chain team in Latin America. FP&A has a number of different strands, and this means that every day I do something different – it is a very varied role! Some of the things I cover include budget management and analysis, annual forecasting, looking at cost of goods sold, the impact of macro-economics, as well as the internal and external conditions… The list goes on! I know that this is where I want to be. I want to stay and learn as much as I can within FP&A. When I start feeling like I’m not learning as much anymore, I’d like to move within FP&A to support another function or region – as each region and function has its own unique set of challenges. That’s the beauty of EBSC – the opportunities are enormous. You are encouraged to move and to try different positions, to stretch and develop yourself, and I think that this is what sets MDLZ apart from other employers. The really unique thing about EBSC is that you can do all of these different roles from the same office! I hadn’t expected Bratislava to be such a diverse city. There are many different nationalities and cultural influences – and this is even more noticeable at EBSC! Just in my team, for example, we have someone from Portugal, Hungary, Germany, Bulgaria, and our team lead is from Russia. It’s great having such a diverse team, you learn a lot from each other. The culture at EBSC is very open and collaborative, and I always find myself discussing challenges with colleagues. The office itself has the feeling of being a start-up; it is very modern, clean, and organised. It seems to have been designed to encourage collaboration, with lots of open spaces. As a newcomer, I found it really easy to integrate, and already feel part of the team. The people are very inclusive, everyone asks how you’re doing – and its little things like that which make you feel part of the team and look forward to coming to work. At our holiday celebration a few weeks ago, I was expecting about 50% of people to come based on other work parties I’d been to, but absolutely everyone was there! I’d say that work wise, EBSC is not like any other shared service centre. We are very close to the business, and are really involved in planning and controlling – this means our roles are challenging and strategic in nature, and provide really positive experiences. Before I moved to Bratislava, I had two main concerns – the language barrier, and the size of the city. I am from a big city with 6 million people, and was concerned that Bratislava might be boring. This was completely unfounded – Bratislava is a great place to live. Although it is a much smaller town than I am used to, it has a really nice vibe, and is very multicultural. There has been an explosion of innovation, there are lots of young people, and there’s always something going on. You always hear of London, Madrid, Berlin as great European cities – but Bratislava is rarely mentioned, which is a shame! There are great companies here, and it’s such a cool place to live. Plus, you can travel anywhere in Europe within about 3 hours! In terms of the language barrier – I haven’t found this to be a problem at all! Although Slovak is completely different to Spanish and English, I am starting to pick up some key phrases… And in the meantime, I’d say the majority of people here speak English. So people shouldn’t let this put them off! I love Oreo, in all of its variations! I’ve also found that I love Milka here – as it’s something we don’t have in Latin America. To view all our current vacancies, please click below and enter 'Bratislava' in the location search.